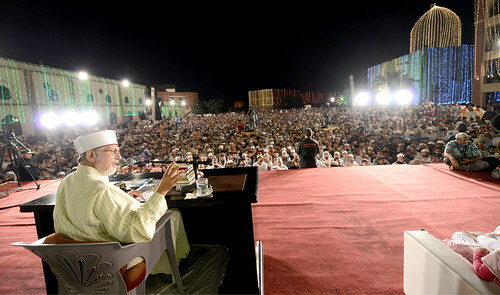 Shaykh-ul-Islam Dr Muhammad Tahir-ul-Qadri reached Lahore to attend Itikaf being held under the banner of Minhaj-ul-Quran International during the last ten days of the holy month of Ramadan in Township Lahore. He was given a warm welcome upon his arrival at the Allama Iqbal International Airport. Dr Hassan Mohi-ud-Din Qadri, President of MQI’s Supreme Council, Dr Hussain Mohi-ud-Din Qadri, President of MQI’s Federal Council, Dr Raheeq Ahmad Abbasi, President of Pakistan Awami Tehreek, Sheikh Zahid Fayyaz, Secretary General of MQI, other leaders of MQI’s various forums and a large number of workers received their leader at the airport. It may be pertinent to add here that MQI establishes Itikaf City every year during the last ten days of the blessed month of Ramadan in which thousands of the faithful from across the country take part. It is the second largest Itikaf after the one held at the Two Holy Mosques in Saudi Arabia. The chief highlight of the mega event is that Shaykh-ul-Islam delivers heart-warming speeches on various aspects of Islam, spiritualism and contemporary problems. The participants of the Itikaf are sensitized about human rights and lectured on Islamic concept of peace, harmony and interfaith dialogue. Given the space constraints and weather conditions, registration for Itikaf starts well before advent of Ramadan and only those who get their berths booked are invited to attend Itikaf. As time for beginning of Itikaf 2013 approaches, the preparations for Itikaf this year have reached the final phase. The heads of over 100 sub-committees, which were mandated to make arrangements for this mega event, held a meeting with Sheikh Zahid Fayyaz, the head of central committee and presented their respective progress reports. The meeting was told that special and elaborate arrangements had been made for the participants of the Itikaf City in view of weather conditions and ongoing monsoon. The thousands of men and women from different parts of the country would join Itikaf City on the 20th of Ramadan.